Caillou Island Towing - Working hard for you! In February of 1987, we (Billy and Joan Cenac) started Caillou Island Towing Company Inc., with one boat, the M/V Virgie Cenac, named for our grandmother. We are the third generation of the Cenac family in the Marine Towing industry. Our grandfather Alfred "Tenner" Cenac Sr. was in the business for many years. Next, our father Alfred "Al" Cenac Jr. was in the business from 1965 to 1987. Our company has expanded considerably and now includes 11 vessels and several deck , spud, shale, and keyway barges. We are always looking to add to our fleet and can build to suit your needs on a long term lease. Through our extensive connections within the industry, we can find the perfect boat to fill your needs. Please, drop by any time and say hello! We strive to provide an open door and relaxed atmosphere for our customers. 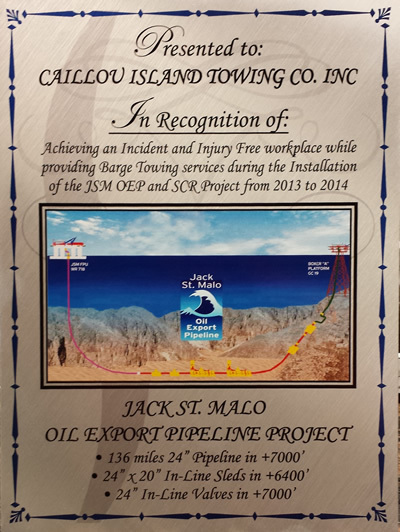 In Recognition of Achieving an Incident and Injury Free workplace during the Jack St. Malo oil export pipeline project.